Braley House Elevation Project: We Are Back In Our Home! 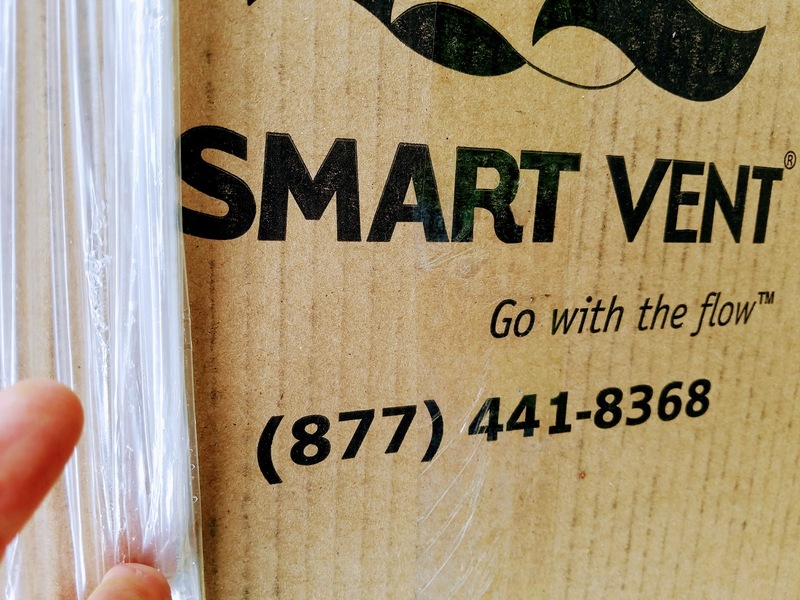 I apologize for taking so long to write about our house lift and some of the final details. Inspections took longer than we expected, way longer! During the process, we were frustrated but now looking back - we can say it wasn't too bad. We did find people within the county government that were so helpful in communicating with us and listening to our frustrations. Without their knowledge of how the county officials worked together we would probably still be waiting for another inspection. Eric enjoying the new door we installed. Note the glass block windows. So, now I am sitting here in my living room enjoying a warm fire in our woodstove and writing, but from eight feet up. The view out of our windows is very pleasing. 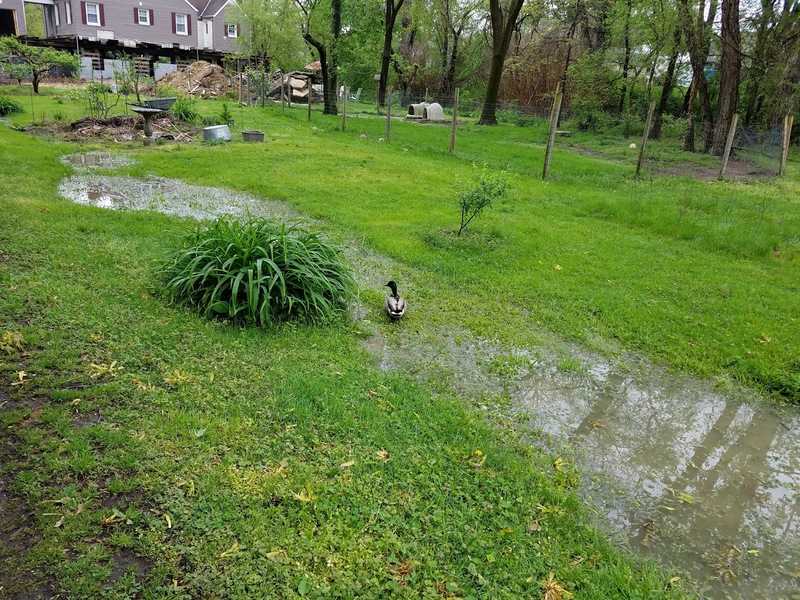 My favorite is from our bedroom where I can see our whole back yard and the stream running through as well as our back driveway. At first, living back in the lifted house was scary. 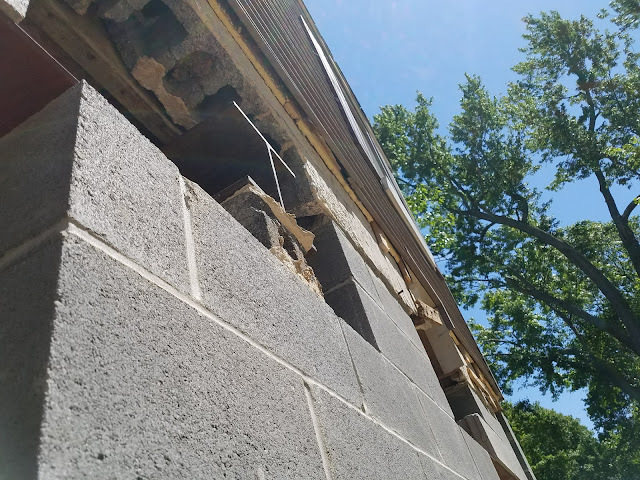 I would hear strange pops and cracks and wonder if the new block walls could hold our old house. 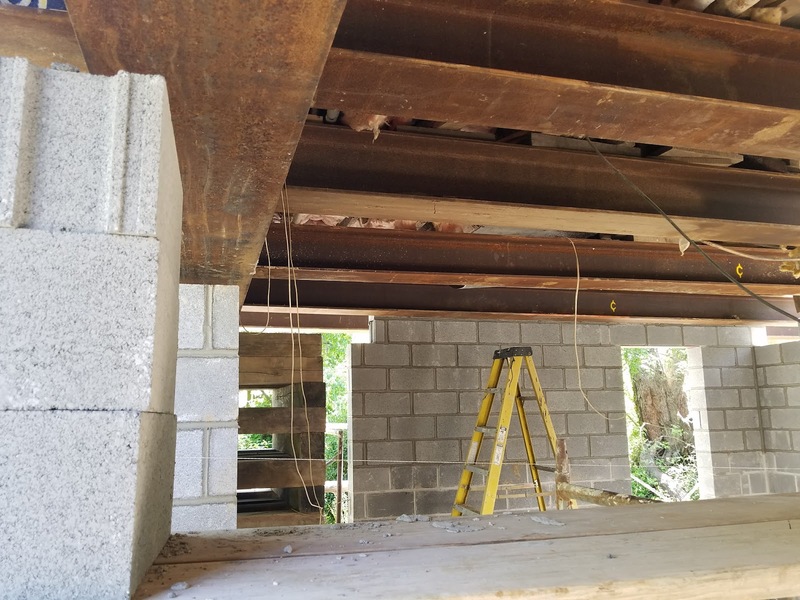 I tended to walk gingerly as if the huge new I-beams under our floor joists couldn't hold my weight. I feel more secure now as time has passed. To say we are finished is an understatement. There are so many details that we still have to finish. 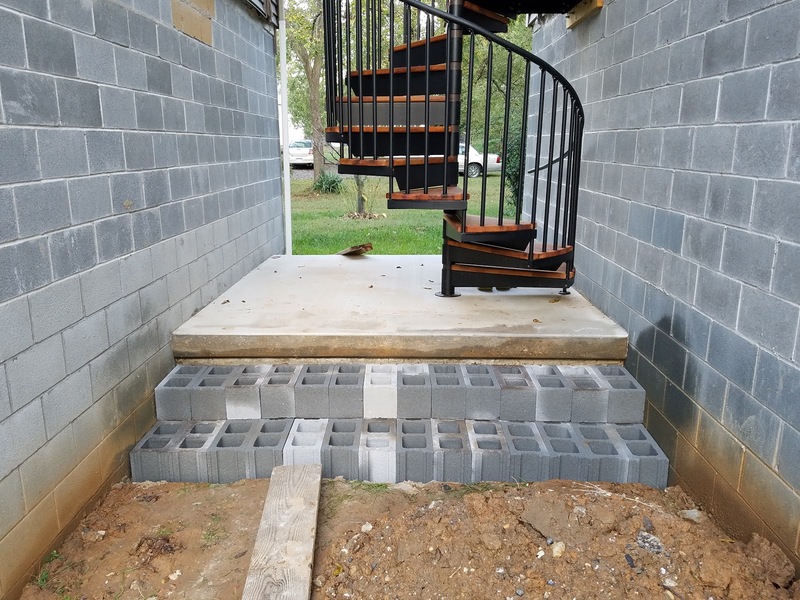 We are still working on installing block steps to our front spiral staircase, and then we will create a walkway to the steps in the back yard as well as the front yard. Our siding needs to be finished at the bottom and we are waiting for warmer weather to paint the block walls with a lime wash paint. Inside, we did have a few cracks in the plaster, mostly in the doorways, so we patched them and have been painting the inside of the house. But now, the holidays are almost on us and we will be resigned to waiting to finish all our projects until later. We are very happy that we went through this process. 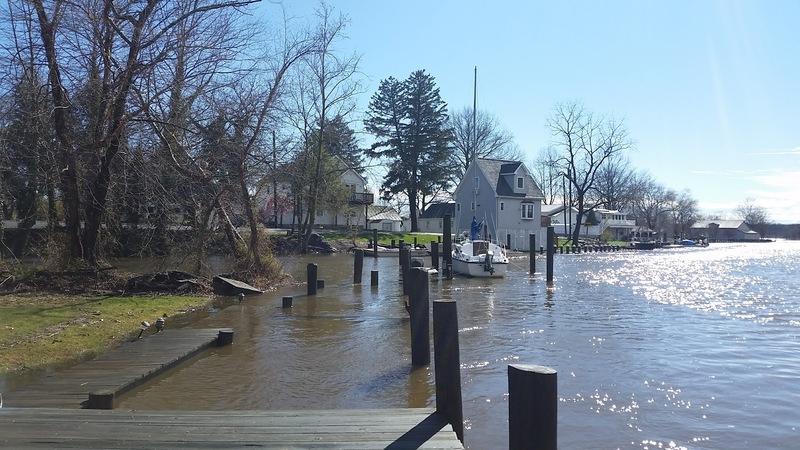 Storms can come and rain can fall and the floodwaters can rise, but we don't have to worry any more. 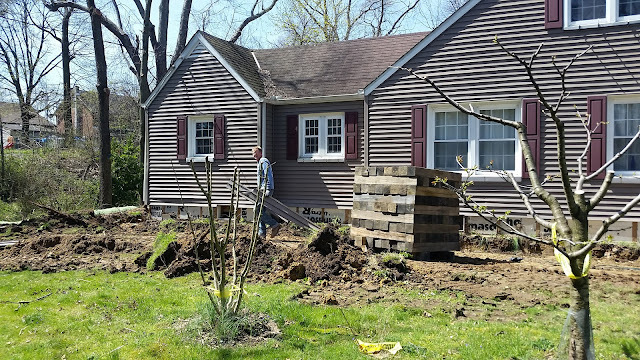 Our house has been saved from the constant dampness of a wet crawlspace. Our new space which we call a basement even though it is aboveground is a huge storage space where we can work on projects out of the weather. 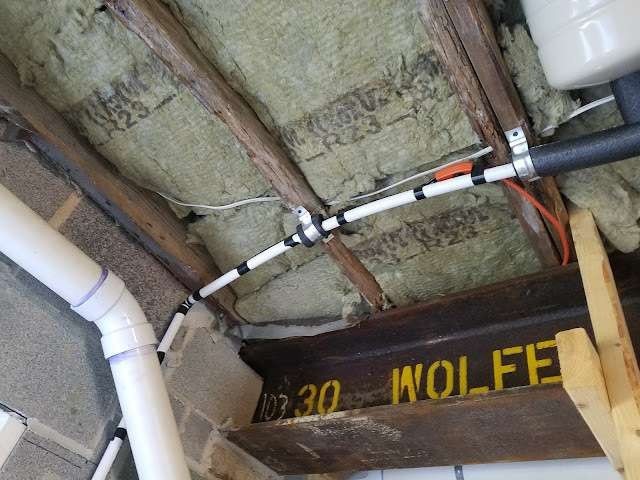 We can reach the plumbing and electrical with ease and spent a little extra to insulate with rockwool between the floor joists. We chose rockwool to insulate as it is supposed to be good for damp environments. 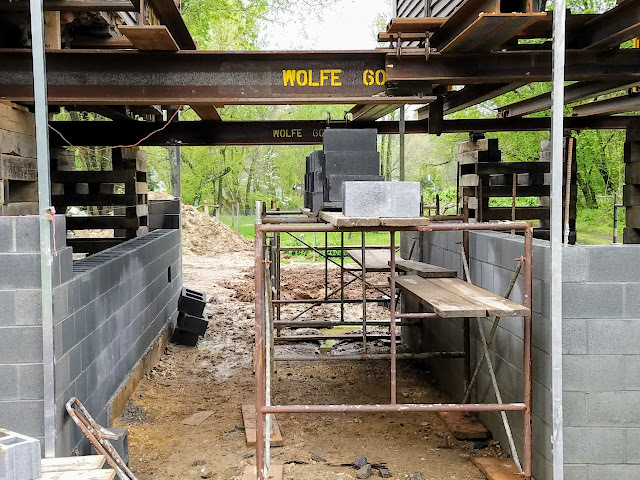 We bought two I-beams from Wolfe - the House Lift Company we used. Here you can see we also used heat tape to keep our incoming water above freezing during the middle of winter. 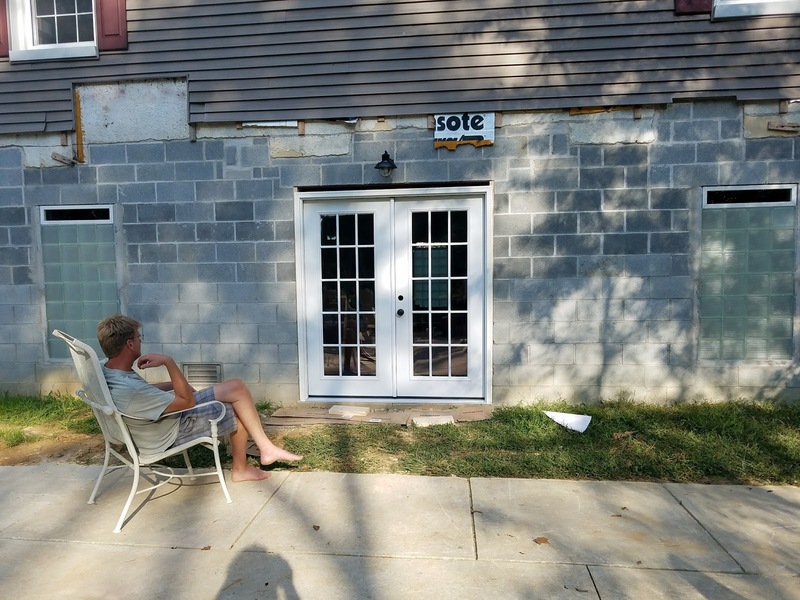 So stay tuned, I hope to post more pictures when we have the outside finished. My last post focused on taking care of all the details after the actual house lift. We are still realizing that there are a lot of details that we did not foresee. Our home at the beginning of the lift. For instance, the inspection process. 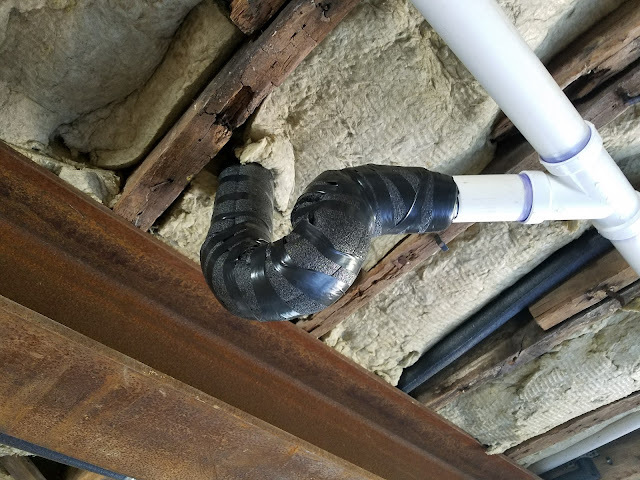 We figured that once the electrical or plumbing work was finished that an inspector would come out and let us know, yes or no, that we had passed the inspection. Well, although that might be true in theory, the process is a little more complicated. For instance, what if the inspector goes on vacation? Or what if the inspector's staff forgets to forward on the report to the county? Or what if the inspector and the county agencies don't agree? The foundation is cut away from the house. One of the strongest recommendations we can make for this whole process of lifting our house and then reconstructing the building on its new framework is patience. Cold, hard unflinching patience that still smiles in the face of delays. Patience will win friends in high places and prevent rushed decisions that might cause regret later. Patience will force you to become creative and find new and sometimes better solutions to problems. We are not finished with our house raising project and I suspect we will be at it for another year or more. If this surprises you, remember that we have been working with this project for over three years. We have learned that rushing is just not a good idea when you are dealing with a structure that is already 71 years old and that we are improving to hopefully last another 100 years. 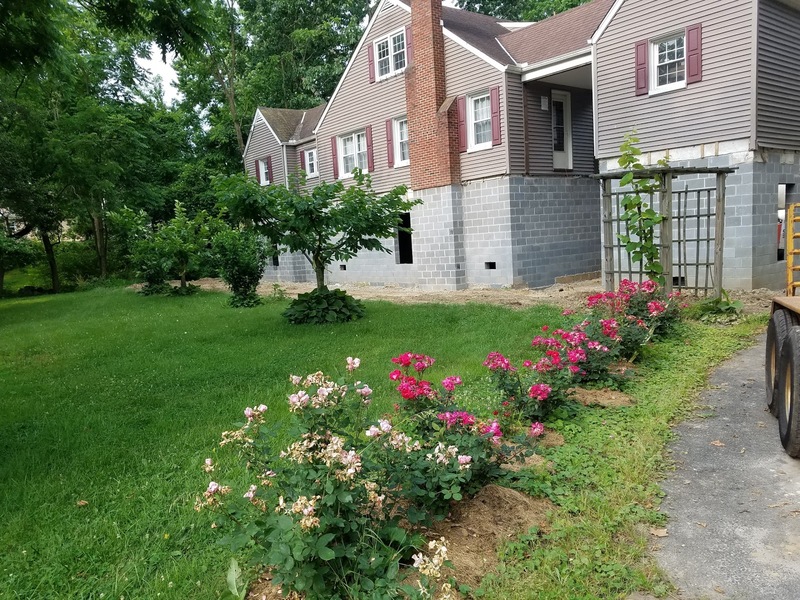 So, we have had to live as gypsies for the last three plus months - I don't think that is a very long time considering the radical improvements we made to our home. Thankfully, the main contractors we found to help us rebuild our home after the lift have been an exceptional team of hard-working individuals who care about the quality of their work; Triumph Electrical, H & B Plumbing, and Dean's Construction, These contractors and their teams found ways to bring our outdated and now, 8-foot-in-the-air-home, back into code without charging us our life savings. Their level of expertise, willingness to communicate, and ability to work around our unpredictable timetable was commendable. I think each of them went beyond the contracts we set with them and did extra on their own time to help us. We can easily recommend each of them. Our new block walls going in very carefully. The town of North East's government was almost as excited as we were to raise our house. They advised us of local procedures and policies to keep our house lift legal and safe. Their encouragement sometimes was just what we needed to keep the project application process moving forward. We were happy to have their team of professional and kind people working with us over the years. Block walls are growing as our yard gets greener. The officials at the county level have worked with us with great patience as we learned how their procedures work. I commend them especially on their communication skills. There is nothing like being frustrated and sending out an email to a government official, only to have a quick response back with almost always a simple solution or at least the effort to help. 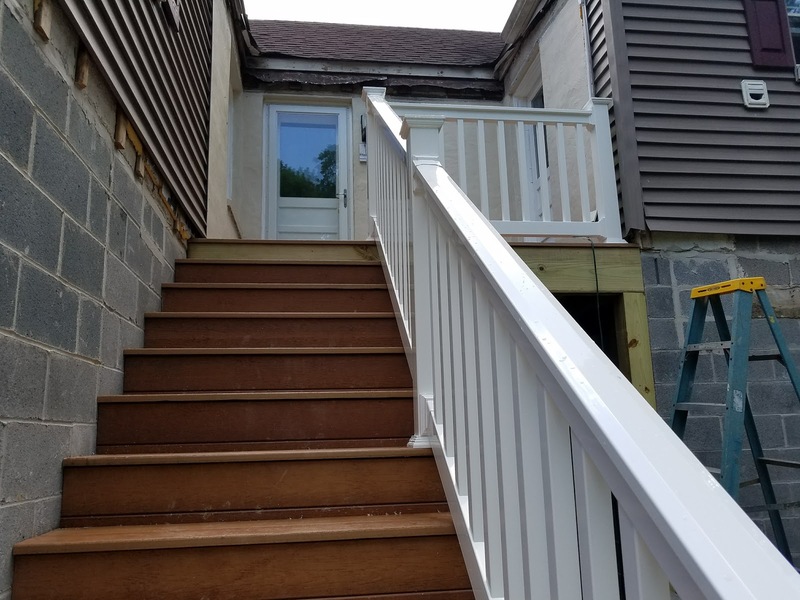 Since we were the first FEMA financed house lift project in Cecil county, new lines of code were necessary and of course that took time both to be drafted and then to be approved by their legal team. Just figuring out how to process the grant funds through the local government on the county level to give to an individual homeowner was a learning process. I can thank them now, but during the process, I must admit I was not the nicest person to them as we waited for approvals. Again, I will mention the virtue of patience! Walls are in place ready for supporting steel beams to be removed. On the state level, from the very first inquiry we sent out as to the feasibility of our project, we only met with a positive and encouraging team of professionals. Over the years that we took to apply and then wait for FEMA funds, the MEMA team kept us updated and encouraged that we were on the right track. When we needed to up our game and improve our application, they advised us how best to improve our chances of getting the approval for funds. So as I write this, we still have inspections to pass and I am sure more details to work out. 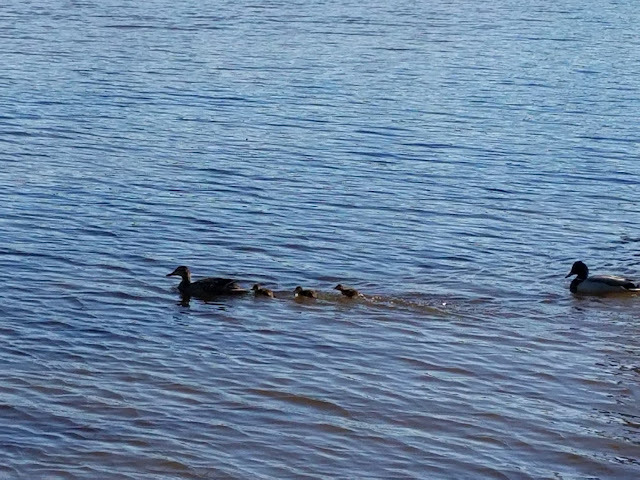 Our relatives are anxious, concerned that we are moving too slowly and that we should do more pushing, but I remind myself that we are not in a rush. If they persist in asking for a move-back-in date, we smile and say, "two weeks!" in reference to the classic Tom Hanks and Shelley Long movie, The Money Pit. If you were to ask me why being patient pays off, I will tell you that by slowing a building process down, you have time to be creative. For instance, instead of popping standard, single hung, vinyl clad windows into our new openings, we have decided to go with glass block. After a short search, we found a source of reclaimed vintage glass block from a 1950's school. A store owner collected hundreds of them to use in his own business, but never used them. He was happy to sell them to us for a very reduced price. How fun is that? We have lots of little projects that we hope to be just as creative with in keeping the character of our home. Our walls are secure and ready for windows and flood vents. So we are learning, step by step, as we finalize the inspection process that good things usually take time. 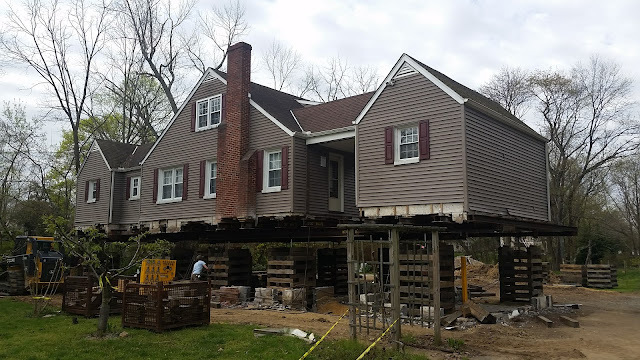 Stay tuned as we come nearer to completion of this process of lifting our old 1950's block home out of the murky flood waters of the Chesapeake Bay. So here it is July 4th weekend and we are still living out of our sailboat. We have had a few nights where the heat was too much for sleeping on the boat and instead we found a cool air conditioned hotel room or visited our relatives. Breakfast on the boat is wonderful when the temperatures are not too hot. I am happy to say that we are really close to getting our occupancy permit. All of our contractors are paid in full and we are happy with their craftsmanship. That means that we now are responsible for the rest of the work, and there is plenty of that! We will install windows and wall coatings as our finances allow but our yard looks like a construction zone. 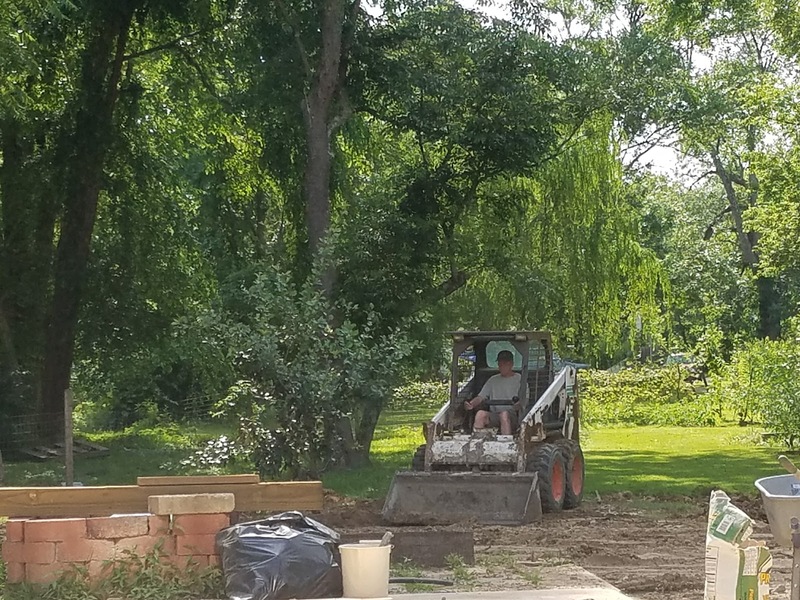 Yes, that's Eric moving dirt around. 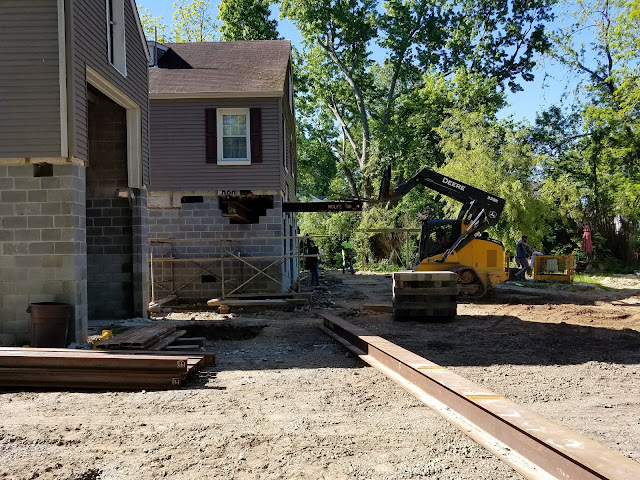 Heavy equipment made light work of lifting out house and moving building supplies, but they tore up our soils and now with the sun baking the ground, I don't think we have too many microbes standing by to help new plants grow. But, not to worry. 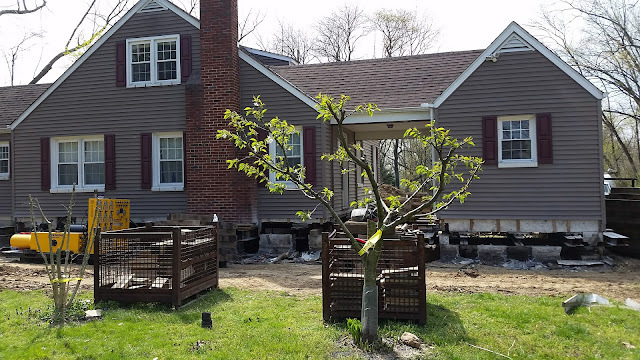 I love a challenge and although I really don't like temperatures much above 75 degrees, I think we can create a new home for lots of interesting plants. 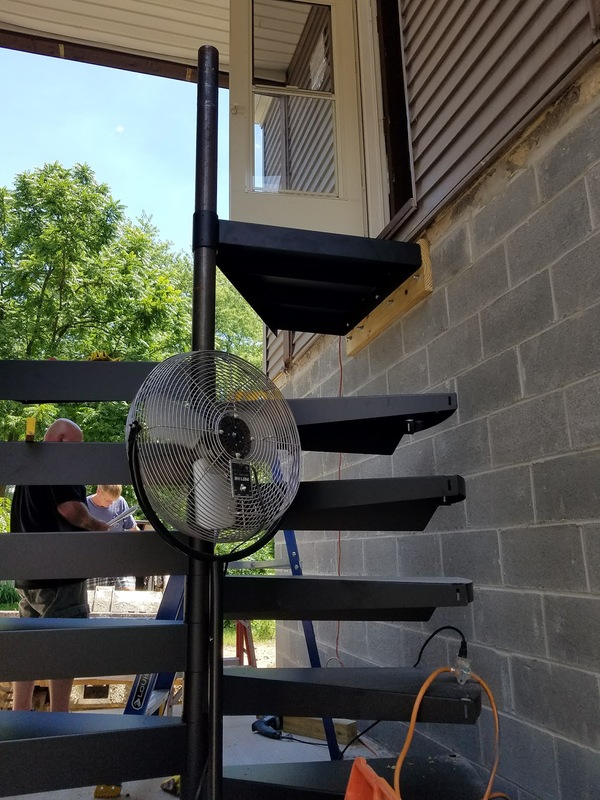 Flood vents will keep flood waters flowing out of the house. FEMA required a few things of our project - like downspouts that direct the rain water away from the house, as well as away from the stream running next to our house. 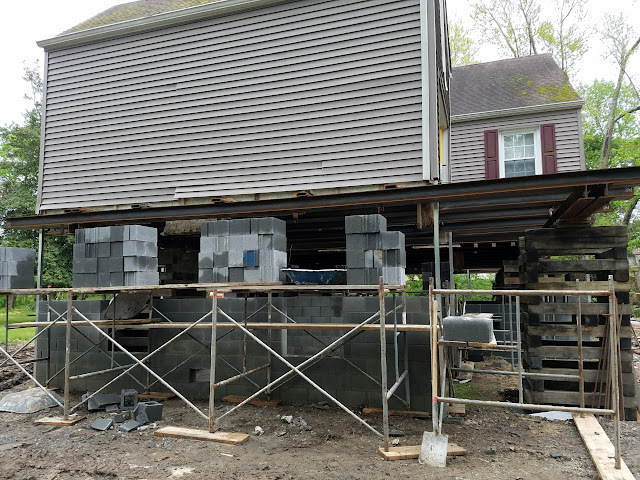 Our existing downspouts are about eight feet too short, so we will have to attach extra sections. We finished installing flood vents into openings in the block walls that our mason left open for this purpose. The vents were very expensive little gadgets that serve a dual purpose of ventilating and allowing floodwaters to pass through the new area. Our new sewer line going in. Fill dirt needs to be leveled up to the house about eight inches below our flood vents. We did find a contact from Craigslist who is bringing in soil from a construction project from State Highway. 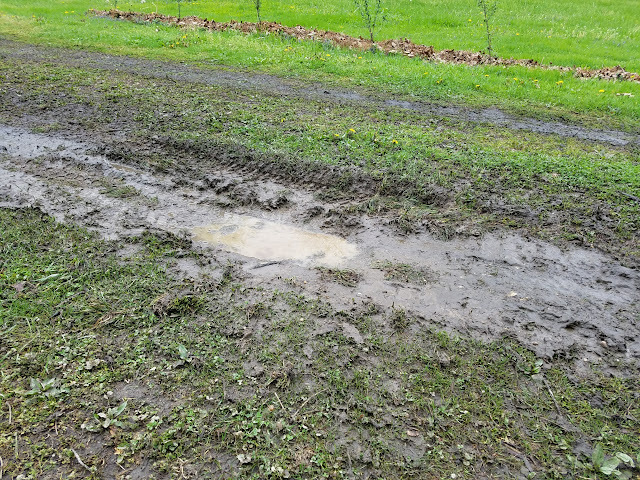 He is happy to find a place to put the extra dirt from drainage ditches they are installing along a roadway and will give it to us for free. 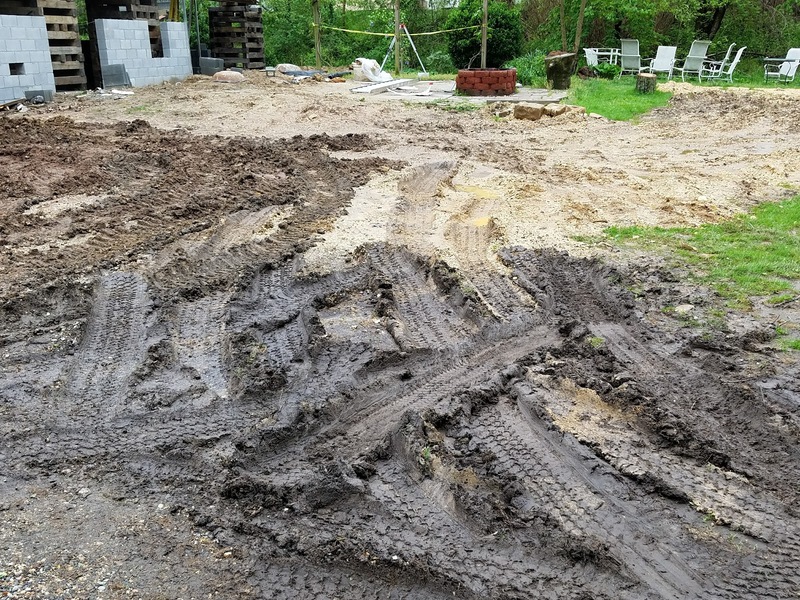 We did buy one dump truck load for a couple hundred dollars thinking that surely that much dirt would be plenty, but we still need lots more. Our new spiral stairs being installed. Under our new deck, we have to install pea gravel to prevent rainwater from splashing up mud. 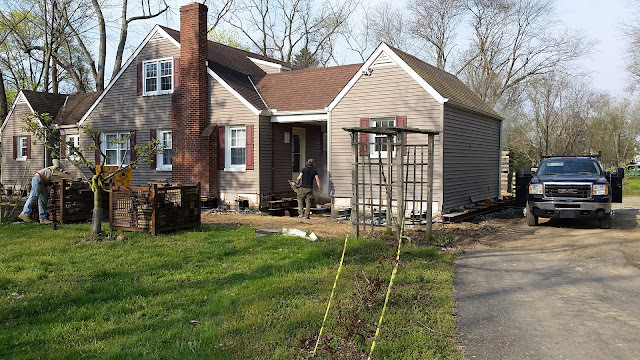 Our siding needs to be trimmed to an even level and finished off and we are hoping that with the siding we saved, we can get by without having to buy new sections. Our new stairs and deck! Our spiral staircase is over halfway installed and looks just beautiful, but we still need to install the handrail and the central balustrades. Then from the base of the stairs, we need to create steps down to the new ground level. So yes, our project is almost done but I think we will still be working on the details for another six months. It's a once in a lifetime project and now hopefully this house will last for several more generations. You would be amazed at how many people tell us they would love to be able to sleep on a boat. I guess I might say the same thing but since I actually do sleep on a boat, I thought I would describe the experience. Sleeping on a boat is really a wonderful experience overall. Once the sun sets and we come into our cabin, I feel like I am at home. We close up the hatch to keep the bugs out. However, we made a slight adjustment to keep us from feeling totally closed in by cutting a plexiglass window for part of our wood door. We plug in our extension cord that goes from our single outlet on the control panel and to our ultra efficient LED flat screen tv. Eric usually pours us a glass of wine and we proceed to fuss about changing our clothes, washing up in the little sink with water warmed in our electric kettle and charging our phones if needed. 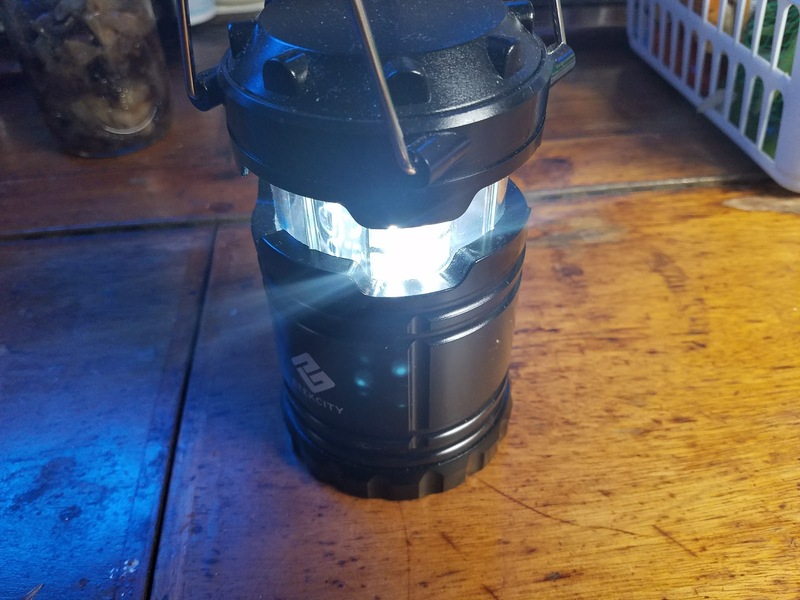 We have a couple of pop up led battery operated camping lights that we use until we are in bed. We could use our cabin lights, but on this old boat they are still wired to the battery and that only charges while the engine is running - which we are not doing much of right now. 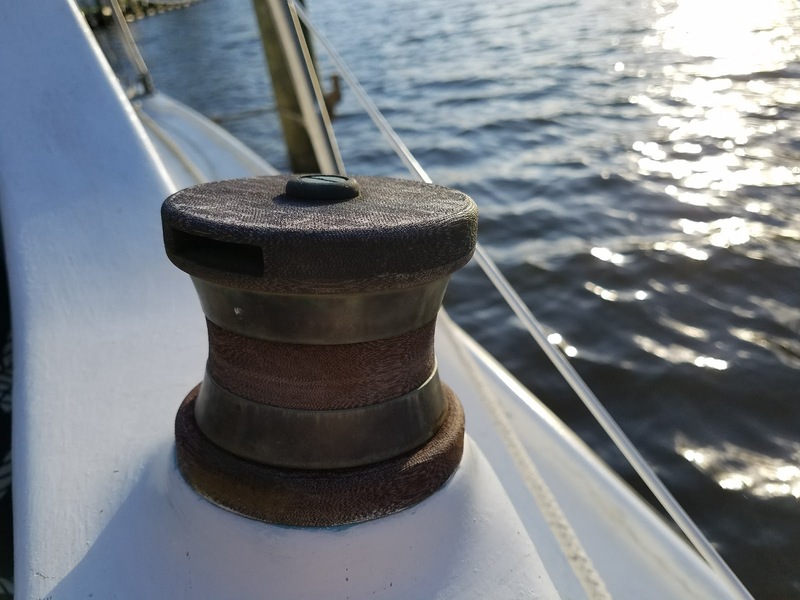 Our berths are twenty-seven inches wide at their widest and go down to fourteen inches at our feet. The opening is about fourteen inches high on top of our cushions so when we add in blankets, that space becomes even smaller. 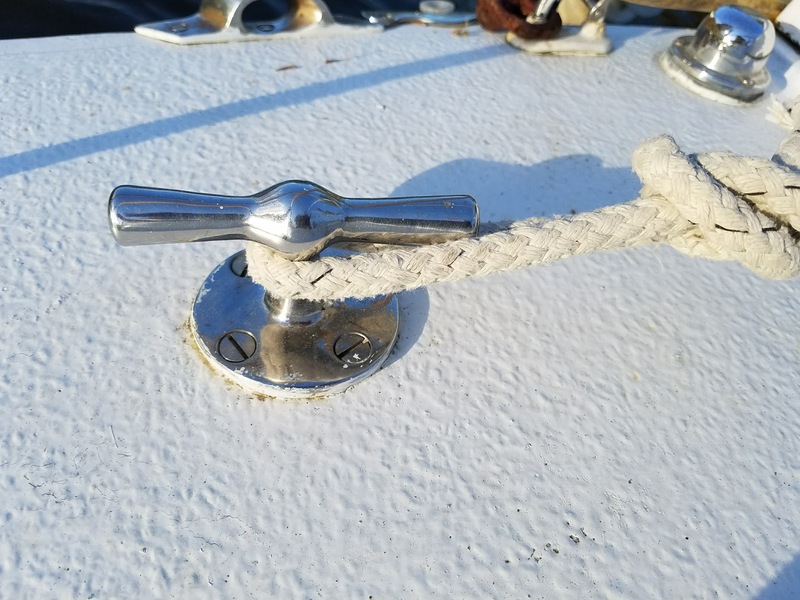 Instead of a V-berth like a lot of boats, ours has two separate berths that hug the outside of the boat with a walking area between that leads into our bathroom. We crawl into our berths and situate our pillows to watch a little Netflix, Amazon or YouTube shows on the television that we mounted between us on the bathroom door. For those interested in how we can have television reception, we use my T-mobile phone with unlimited high definition data for our hotspot. Usually within 30 to 40 minutes, we are starting to nod off with the gentle rocking of the boat. 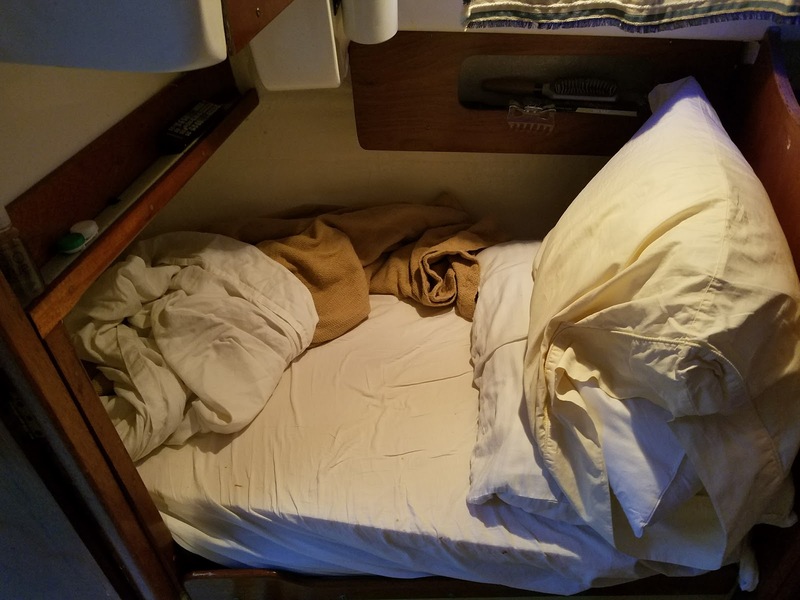 I will say when we first started sleeping on the boat, I was very claustrophobic and and to really concentrate on not thinking about the fact that I was in a tiny compartment in a tiny cabin on the water where I could sink or be hit by lightning or float out to sea. Now I am much more comfortable about crawling into my berth where just turning over takes several little micro moves. The sounds. The absence of human noise is quite refreshing, although if the wind comes from the north, we can hear traffic from the highway a few miles away. We do hear the Marc train or sometimes the freight trains as they pass in the night, but they are far enough away that we don't think about them. What we do hear is geese, lots of geese. They fly in at sunset and make quite a racket. Once in a while, they make noise in the middle of the night but we don't mind. 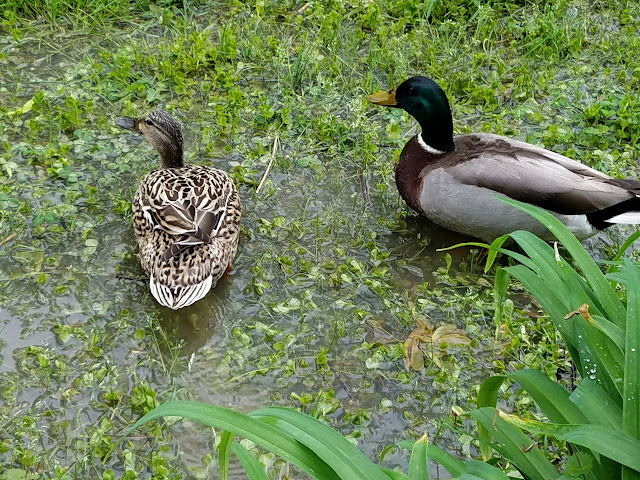 Ducks are the second noisiest and it's quite fun to hear them right outside our hull. 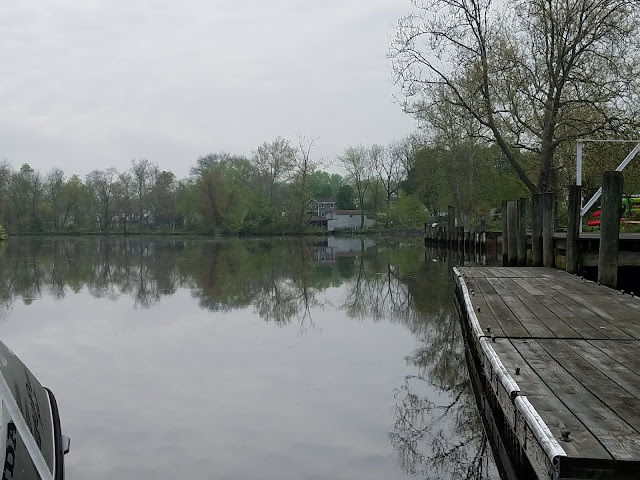 Then we can hear owls, or the weird and awkward honk of the blue herons. Would you believe we even hear fish?! We have a lot of carp that jump out of the water around the boat and sometimes they will even wack the boat - surprising me out of my sleep. Then there are the early morning fishermen that don't know we are staying on the boat and talk as though they are the only ones around. Sometimes that is irritating; sometimes kind of funny, too. The tree frogs are starting to sing at sunset and we have a couple of bullfrogs that lend their bass notes to the evening calm. Rain is my favorite sound when it is not associated with a storm. Overall, our boat with its dual keels is very stable and I have a hard time realizing that I am even rocking. Comically, I do notice the movement when I am off the boat and realize the ground is not moving. By morning, when the sun rises and lights up the water around us, we are refreshed. I tend to get up first as there is only so much room to walk around. 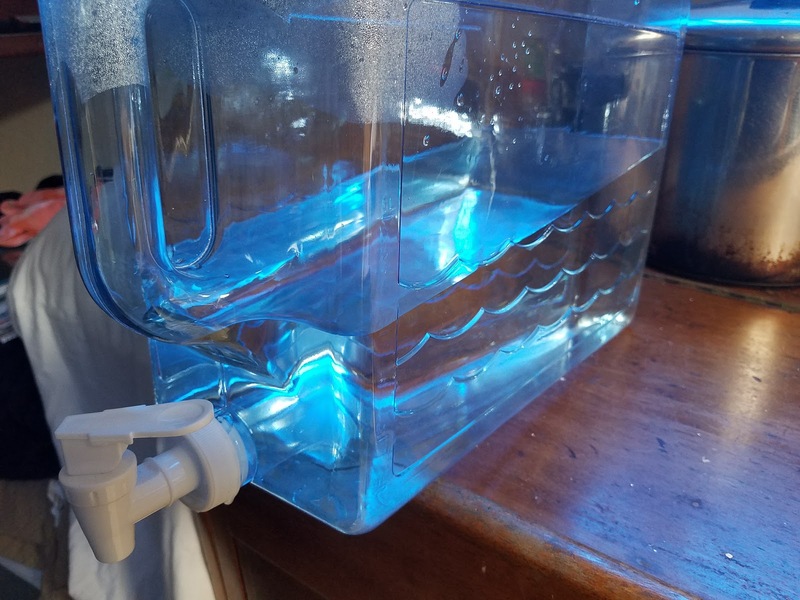 I heat up a kettle of water and while I wait, I brush my teeth in the little sink we have with a manual pump whale faucet. When the water boils, I make two cups of black coffee with our AeroPress and use the rest of the hot water to take my morning sponge bath before I get dressed. Then Eric gets up and does his similar routine while I dry off the outside seats from the morning dew. We sit out there and enjoy our coffee loving the beauty and calm of the water. 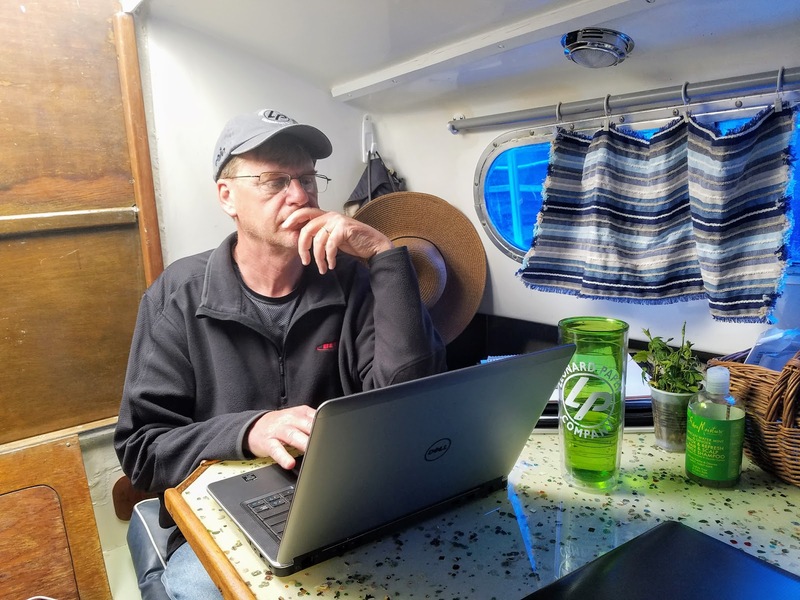 So I have been a little lax in writing any new information but today, the afternoon sun is a little too hot for my blood, so I came inside to sit in front of a fan and write... in the sailboat. 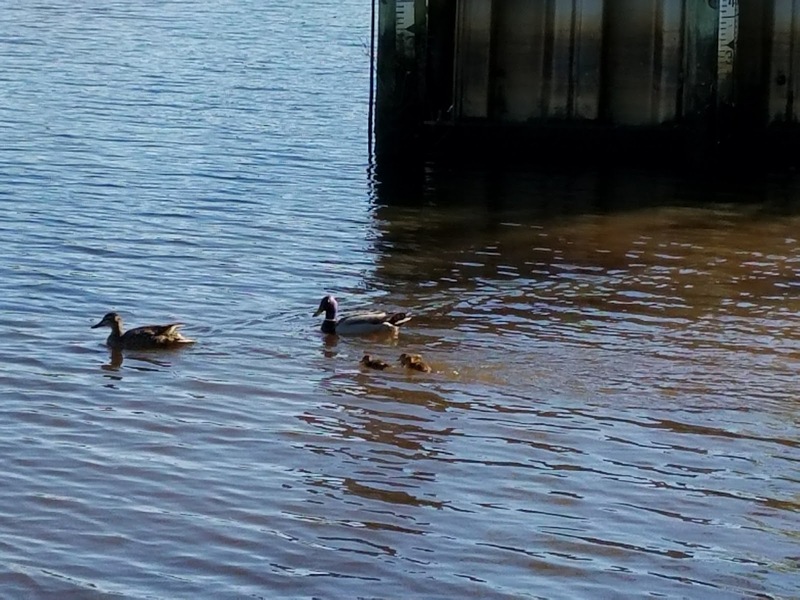 Baby ducklings are swimming around the boat now. If I focus on the view in front of me, I can find relaxation and peace, both of which have been a little lacking in the last few days. If you read my previous blogs, you know that we are lifting our house eight feet higher to eliminate the damage of flood waters. The lift was fast. 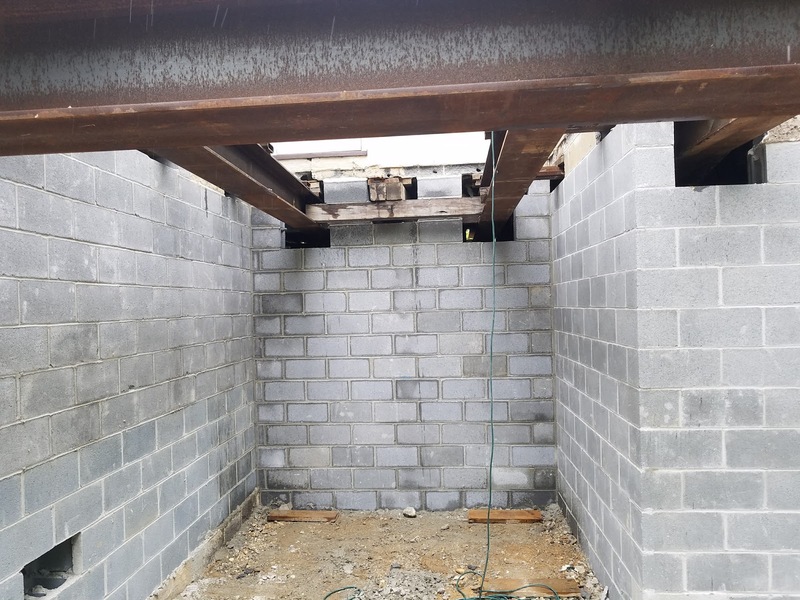 Massive steel beams were set in place and then the block layers moved in. 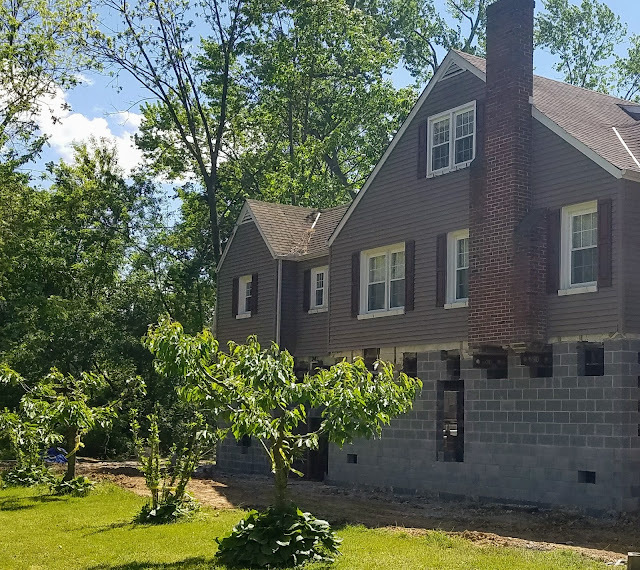 We had to do a little scrambling to answer some detailed questions that we didn't know we needed to know, like how far off the ground do you want your windows? All in all, the walls went up smoothly. Have to get all the steel removed. Then we called the lift company, Wolfe House and Building Movers and asked them to remove the steel beams. We answered their questions, sent them pictures of the walls and all seemed fine until they rolled up the driveway and my quiet morning became very hectic. I didn't know enough - plain and simple. The foreman complained that he did not want to remove the steel as we didn't have the main support beams supported. My response was,"Well then, let's support them!" How hard could it be to grab some 6x6's and some block which was laying all over the place and fix the problem? But no, they asked me to call my mason because they didn't want to jeopardize his work. So I did. You can just see the steel beams poking through. Of course, on this day in history in our county, there was a crazy bus accident on Interstate 95 that closed the road (all eight lanes) in both directions for several hours. No problem - everyone can take the peripheral roads - right? Right, except there were far too many cars and gridlock ensued. Don't forget we live right in the middle between Philadelphia and Baltimore on the route to Washington DC or New York City. So our kind mason got stuck in the traffic - FOREVER! Not really, the time spend waiting for him just seemed like that. I resumed my work of mowing the lawn thinking he would take care of everything until I saw him walking down the driveway towards me with a funny smile on his face. You know - that look that says, "I'm smiling but I am pissed because this lady doesn't know what she's doing but she paid me a lot of money so I have to be patient" look. Who has steel I-beams with their name on it? He was perturbed because after all his driving, they did not need a block layer at all - just someone to install support beams. We had a little discussion and the foreman of the lift company read his directives from his cell phone, "Customer/General Contractor is to support all beams before the steel is removed." Well, we looked at each other and our mason said, "that's you!" to me. 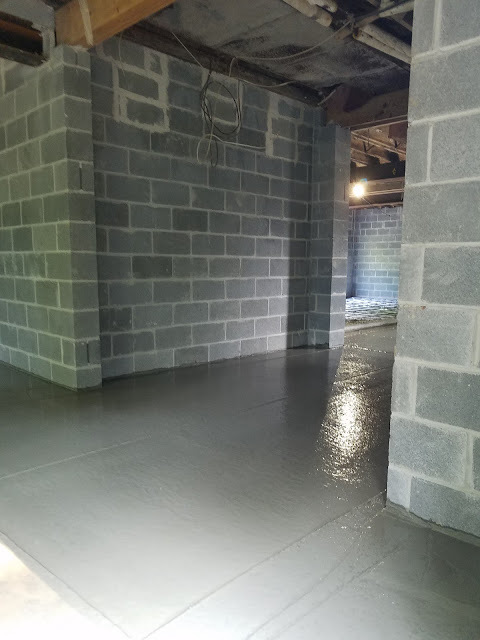 I might have a get-it-done kind of attitude but I knew that I did not have the strength or materials to install support beams in our now 11-foot high basement. Can you see me trying to put up supports in here?! I made an effort as I looked around at the five able-bodied men doing nothing. 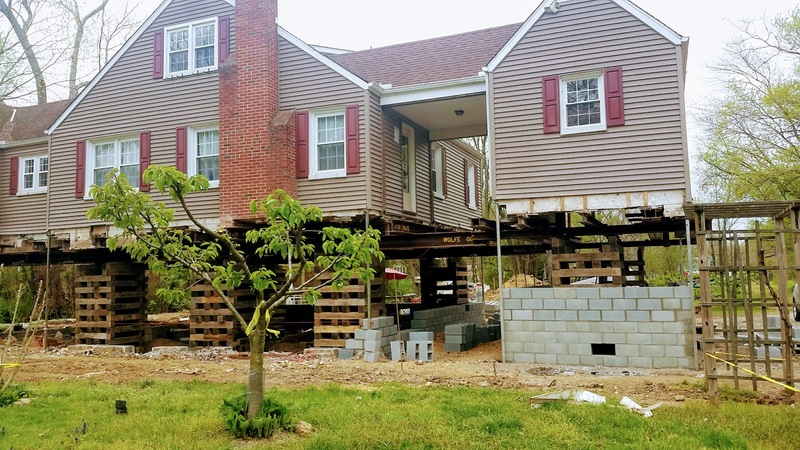 'Let's use some of this block and lumber." Silence and dropped gazes. Hmmm. That didn't work. I guess I was a little naive. 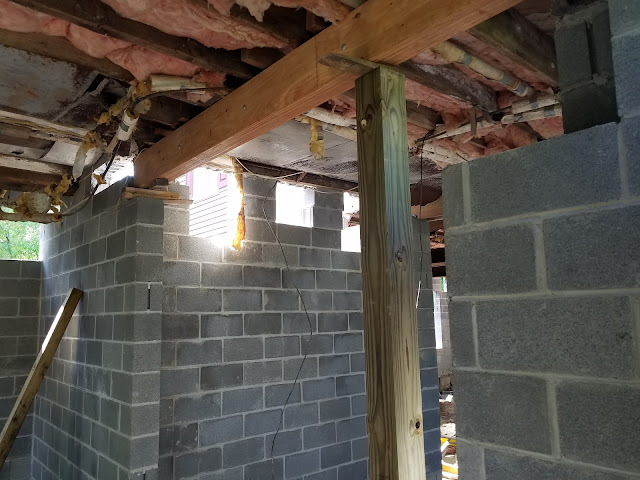 Our mason must have felt sorry for me and took the initiative and installed two supports with the help of my expert pole holding capabilities. 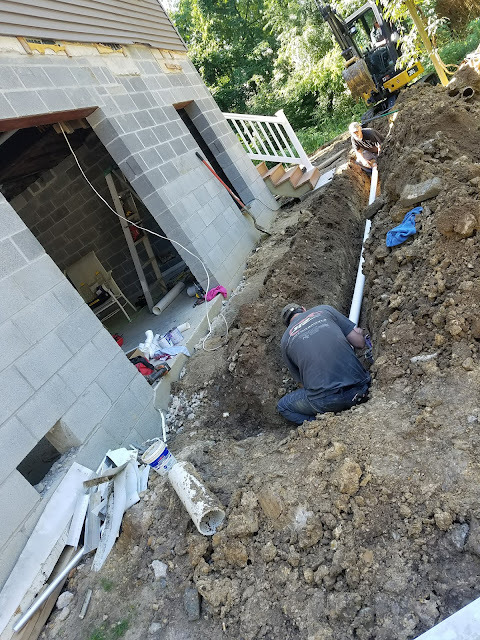 He walked me around the inside of our new basement and told me what we needed to do to ensure that the interior of the house didn't collapse once the steel beams were pulled out. Armed with my notepad, I called Eric, only to find he was in the middle of a training appointment, Next, I called my brother who works as a general home repair guy. He jumped to my rescue as he was working from home on some estimates - only he was an hour away. The delay gave me some time to research where I could get the beams and supports we needed. You can see the steel being pulled out of the house. Almost. 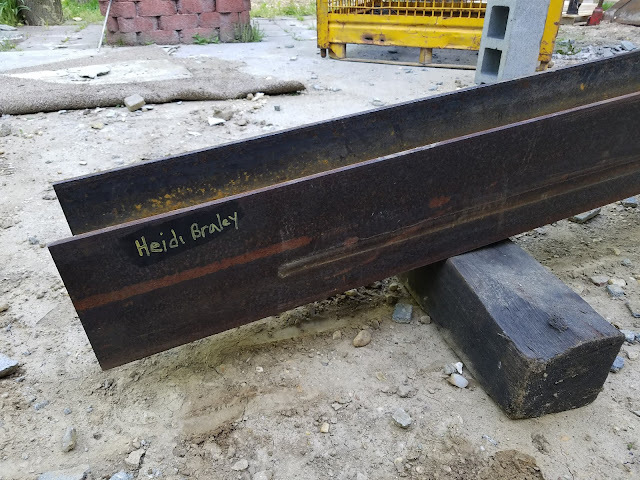 My brother and I got home first and we set about drilling holes to bolt the LVL beam together. Being a home repair guy meant that he had every tool imaginable in his sprinter van. We then went under the house to clean up the ceiling where we wanted to install the beam. I got busy bringing in an extension cord so he could cut off some old nails hanging down and then I turned towards him as he commented on how easy the old nails were pulling out of the wood but before he finished, I heard the clatter of the aluminum ladder falling against the block walls and then saw my brother flipping over in the air and falling head first towards the base of the ladder. It's in times like this that I really wish I could stop time for a couple of seconds to adjust a few details. But in the real world, I have to deal with real time situations and I watched my brother's head slam face down into the rubble of broken concrete block and then his body smashing against the rungs of the ladder as it fell onto the ground. My brain was in over drive and recording bits of information as fast as I could catch them. He was groaning very loudly so I knew he was alive and not unconscious. He rolled himself sideways pushing himself with his legs - they probably weren't broken. As he turned - blood was gushing down his face over his right eye - but his eyes were okay. I couldn't see any punctures anywhere else. I tried to tell him to sit but then ran to get my phone and dialed 911. I turned around and he had walked on his own out of the basement and I found him an old office chair to sit in while I was talking to the phone operator. I kept checking his eyes to make sure he wasn't going unconscious as the call continued. Although I felt like the ambulance was unnecessarily slow, they made it and bandaged him up and decided we could drive him to the hospital instead of taking the ambulance. Two hours later, he walked out of the urgent care facility with a three inch gash that was terribly swollen and red with a more than a dozen black stitches holding his forehead together. The groans of shock in the waiting room surprised him as he hadn't seen how nasty his head looked. I drove him home just to be smart and gratefully turned his care over to his wife - a well experienced nurse. Back at the crime scene - or at least the job site now tainted with bloody bandages and gloves...The sun had set and I found Eric and our son, John who kindly left his evening routine to help us in finishing up securing the last beam in place. I took over holding the work light as they drove the last few shims into place. By 9:30, we were back on our boat in the dark, exhausted, dirty, but really grateful that my brother's injuries were not so severe as they might have been, and that we were ready for tomorrow. This morning, Eric and I woke up early with the sun and walked around the house to check our work. after a couple of adjustments, he left for work. The lift company came and removed the steel. I need to finish this blog post so I can inspect the site once more today and make sure all has gone as planned. 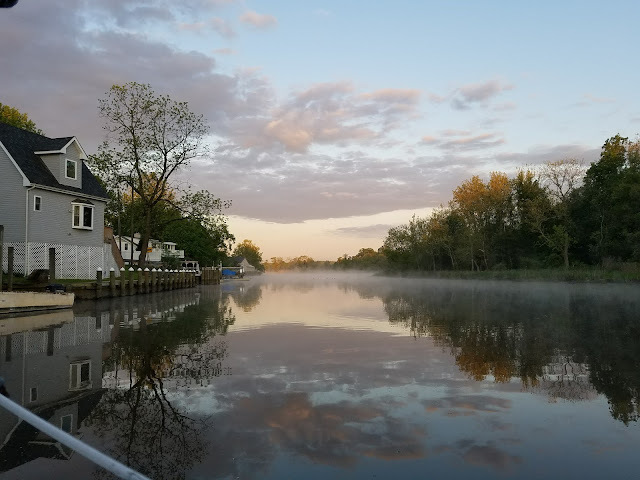 Just a regular morning's view from the boat. So this post is all about how we live while our house is under construction. While we were in the planning stage, we researched many places to stay; apartments, relatives, tenting, campers, etc..., but none really seemed to work for us. Apartments might have worked, but there were none close enough that would allow us to stay from month to month. So our solution? Stay on our sailboat! Getting ready to drop our '69 Snapdragon into the water. We bought an old 1969 Snapdragon. 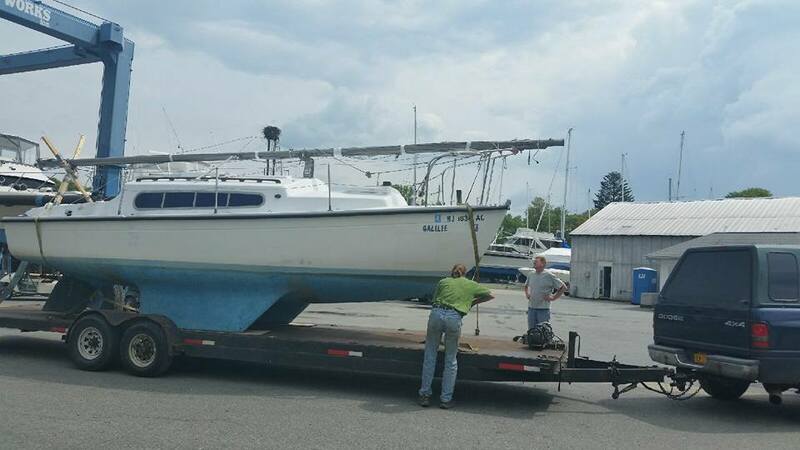 26-foot, double hull last year. Although this boat was designed and built in England for the waterways between the hundreds of islands around the British Isles, we find the boat perfect for the shallow waters of the Upper Chesapeake Bay. Because of the double keel, we don't tip when the tide drops super low and the boat can sit level in the mud. 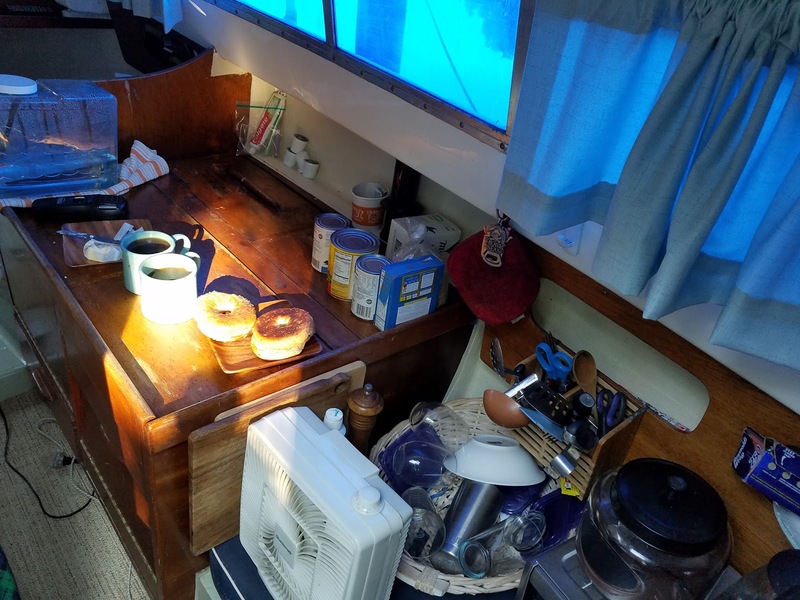 Inside our boat, we have a cute little table which I redid with an epoxy coating to be a little brighter and user friendly. We have a manual pump sink and a stove compartment where we have an electric induction burner. Our berths are about 6 feet 4 inches deep, just okay for Eric with his 6'3" frame. I tend to be a little claustrophobic so I have to consciously choose to not to think about our close quarters. We have a forward room that many boats use as a v-berth but in ours it serves as our bathroom where we have a bucket that serves as our composting toilet. 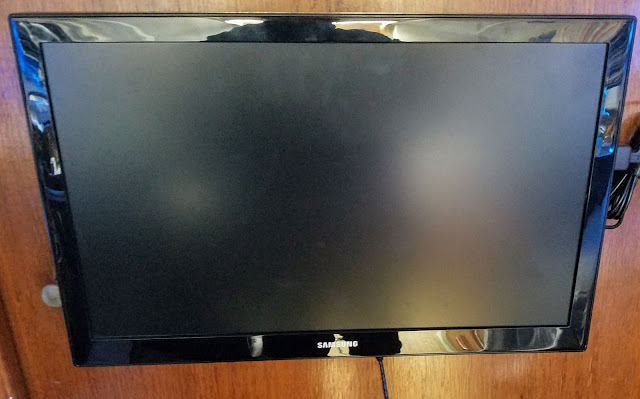 Since we can plug into electricity on our dock, we have a super-efficient LED thin television mounted for watching Netflix, YouTube or anything else we might fancy. Rainy nights are extra cozy when we are snuggled into our berths with a glass of wine and a fun tv series to watch. Mornings are pretty nice too, after we boil some water in our electric kettle, make coffee in our convenient Aeropress, step up to our cockpit area, sip our coffee looking out at the water while checking our emails on our smartphones. 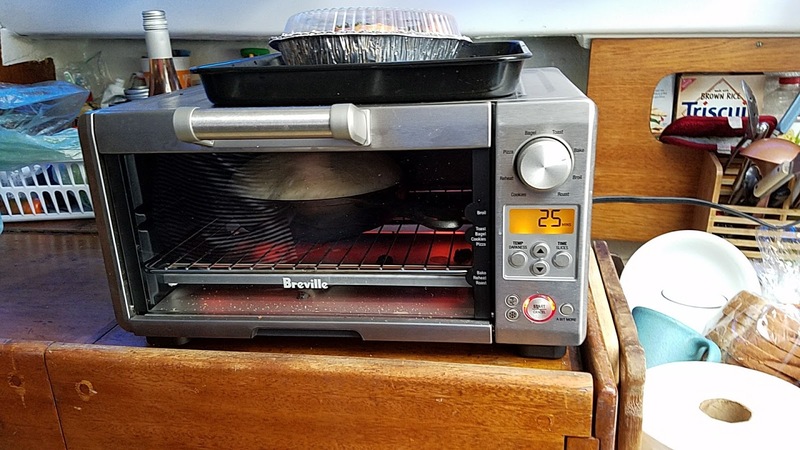 I even baked bread a couple of days ago in our little Breville oven. We enjoy a cool mix of old fashioned goodness with the comforts of technology. The tougher side is the tininess of our boat. We have lots of storage compartments but they tend to be under seats or counters and so we have to work hard to stay organized. Thankfully, we are docked just off our own property where we have a trailer filled with Eric's work products as well as our clothing. We don't have a shower but we retrofitted a regular garden weed sprayer with a shower head and painted the canister black. After sitting outside all day, the water has warmed enough to take a decently warm shower by evening. Our cockpit is self draining so we can stay on the boat while showering. However, the biggest problem is the height of the boat. I can stand up straight in the main compartment but Eric can't stand up at all. I think our ceiling is 5'6" which is just super short for Eric. We can't complain yet, though. The weather has been beautiful for living aboard a boat. We have enjoyed chilly nights where the blankets feel good and warm days for sitting outside. Eric can fish anytime he feels like it and sunsets are part of every day. We hear some traffic from the road and just a couple of boats from fishermen that live on our part of the river. During the day, I find it amusing to see sport fishermen working the waters around our boat, unaware that I am sitting inside working on my computer looking through our windows at them. Eric is a Regional Territory Manager for his company and that requires some overnights during most weeks. I don't have a problem being alone - in fact I kind of enjoy it sometimes. So of course, after a few days on board, he told me he was going to be out of town and after reviewing the timing and distance of his trip, I decided I would stay home to stay on top of our house lift. Our supporting walls are getting higher! During the day, I worked on the yard and then went out shopping to get a few groceries. Eric called me just as I finished to check on me. I was cheerful - having a great day and told him I was about to get back out to do a little mowing. Assured that all was well, we agreed to talk again once he arrived at his destination. I picked up all the grocery bags and my purse and headed for the boat. The tide was going out which meant I had to stretch my legs a little to step onto the boat but I was confident and reached out to pull a back rope for support. I realized I wasn't going to reach the step but since I was already leaning in towards the boat, there was no way for me to pull myself back on the dock. I grabbed the side of the boat with my one hand, still clutching all the groceries and my leather bag and of course, the boat pushed further away from the dock and I just fell into the water - all the way in, groceries and all! 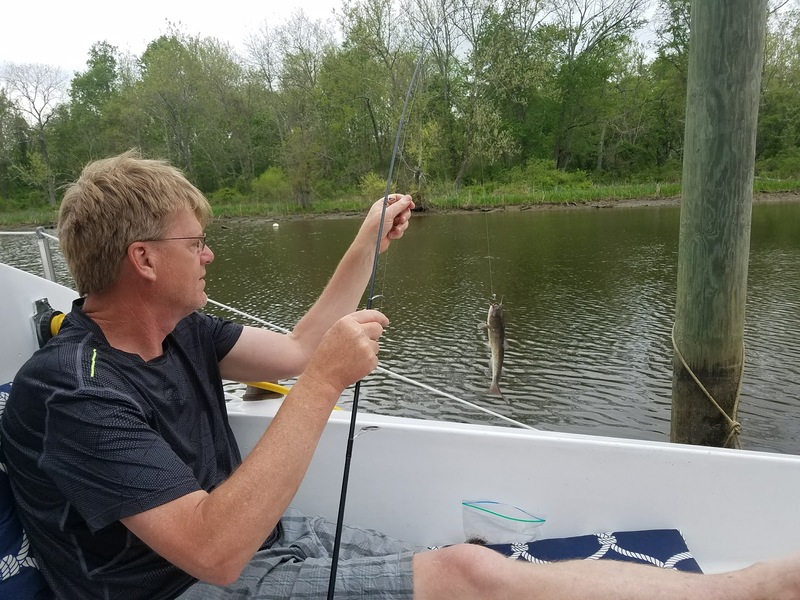 As I came back up to the surface of the water, I grabbed a cleat on the dock and tried to throw the groceries up over my head. It worked and so I tried throwing my leather bag up as well, but of course, it flopped and ended up upside down on the water. Quickly I righted it and successfully tossed it on the dock. Mind you, this is April and the water temperature was about 50 degrees. I knew I didn't have the strength to lift myself out of the water so I swam over to a floating dock chained to a piling. 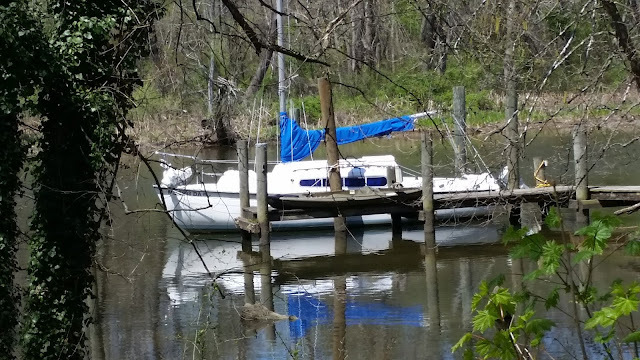 I used the piling as leverage to push myself up onto the dock, yes, to emerge safely but looking like a drowned rat. My confidence was badly damaged but I managed to carefully lower myself onto our boat and grab a towel. All the groceries were safe, except a new small hand vacuum cleaner I could see still floating in its box under the dock. Once I fished it out, only a few drops of water had permeated the plastic bag protecting the machine. Next, I emptied everything out of my leather bag and began laying my credit cards and the other contents out to dry on our cockpit area seats. Panic hit me as I realized my cell phone and car keys were missing. As my mind played through the flashback of my fall into the river, I realized when my bag flipped upside down, my phone and keys in an outer shallow pocket must have fallen out. I peered down into the murky depths beside the boat and knew that I had no way of finding them just then. 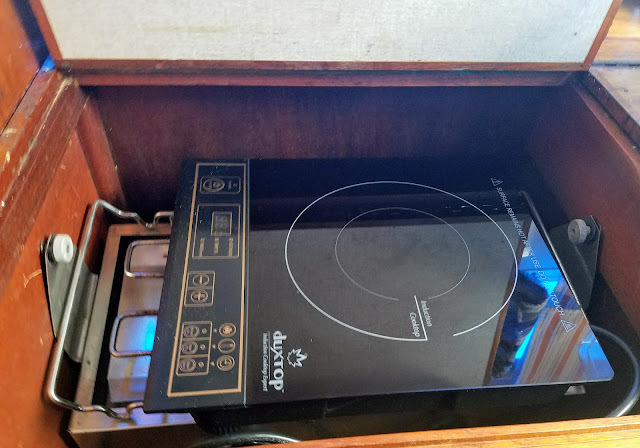 This little Duxtop induction burner works very efficiently as our stove. What to do next? No phone, no keys, no internet, no television, and a storm on the way. Just my lucky day to be home alone. 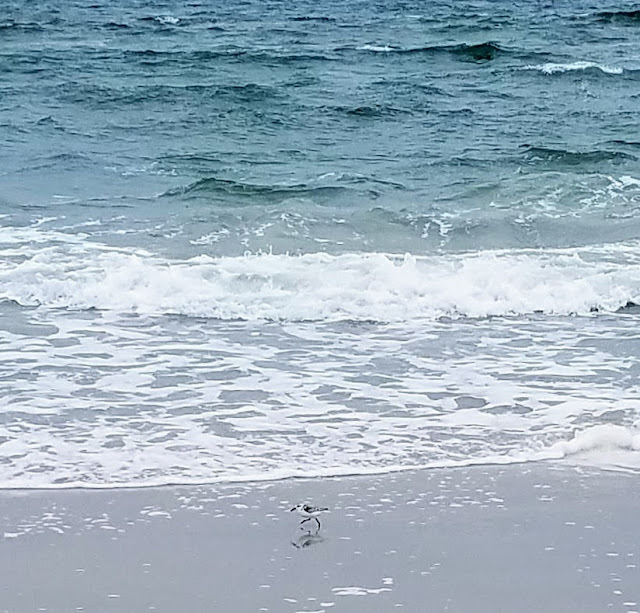 I thought about my options and although I would be fine overnight, no one would know and without an ability to communicate, my family would certainly be worried for my safety. I remembered that I had a spare set of car keys, but they were safe and sound hanging on a key hook inside our home sitting on cribbing piles, now eleven feet above the ground, above mud and construction rubble. I had to get in the house. A twelve-foot ladder was left in our yard, so I was able to work it into position under our laundry room door. 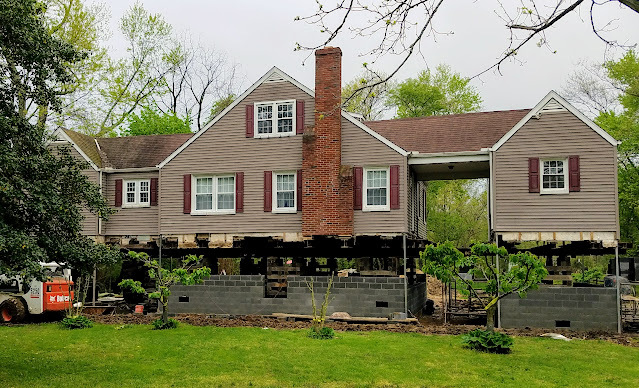 With much trepidation, I entered my home, knowing the steel beams and cribbing piles were totally safe, but still terrified I would cause the floors to somehow cave in. I gingerly stepped my way through the familiar rooms to the spare set of keys hanging inside the front door. Once back in the laundry room, I ignored my fear of falling again and carefully climbed onto the steel beams and then down the ladder. Next problem, find a phone. I tried using my laptop to access a hotspot from local businesses but their signals were too weak. Next, Walmart. I walked into the tech department and told the associate I wanted to buy a phone. She explained that they only carried phones for certain carriers but was kind enough to do a little research on her personal phone to tell me where I could locate my carrier's storefront. 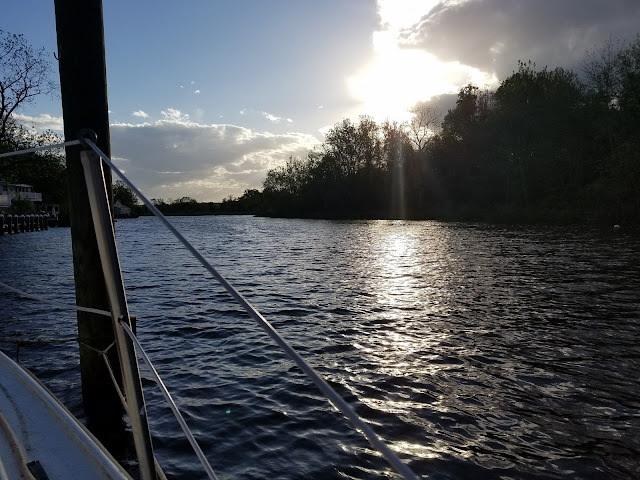 Armed with my new information, I headed the few miles down the road, determined to be back at home on the sailboat before dark. Within about an hour, I had an upgrade from my old phone and all my contacts, pictures and information loaded for only a few dollars more a month on my bill. Thankfully, everything I do is backed up on Google so only texts were gone. On my way out to the parking lot, my new Samsung Galaxy S7 rang. Eric was calling to ask me if I had bought a new phone since he was my security contact. I was all too happy to relive the experiences of the last few hours and get a little sympathy and compassion from him. I made it home in plenty of time before sunset and set about making my dinner and relaxing as I explored my new phone. Overall, I had a calm evening and settled into my berth after setting up the television using my phone as my hotspot. And then I heard the thunder. Normally, I love thunderstorms and their excitement. That night, my nerves were still jumpy and I quickly started researching the safety of staying on a sailboat during a storm. The stories that popped up were terrifying and since the rain was already pouring down on the boat, I knew I wasn't going anywhere. I decided our boat was a good stable boat that had survived over the decades without being struck by lightning and so I was probably safe. I will say that was a long night as the storm lasted for what seemed like forever. So, yes, sailboat life is awesome and awful. We pick and choose how much we can handle by staying at friends or checking into a hotel room. Tonight, Noaa is predicting strong winds and thunderstorms so guess what? We are securing the hatches and spending the night with my brother! 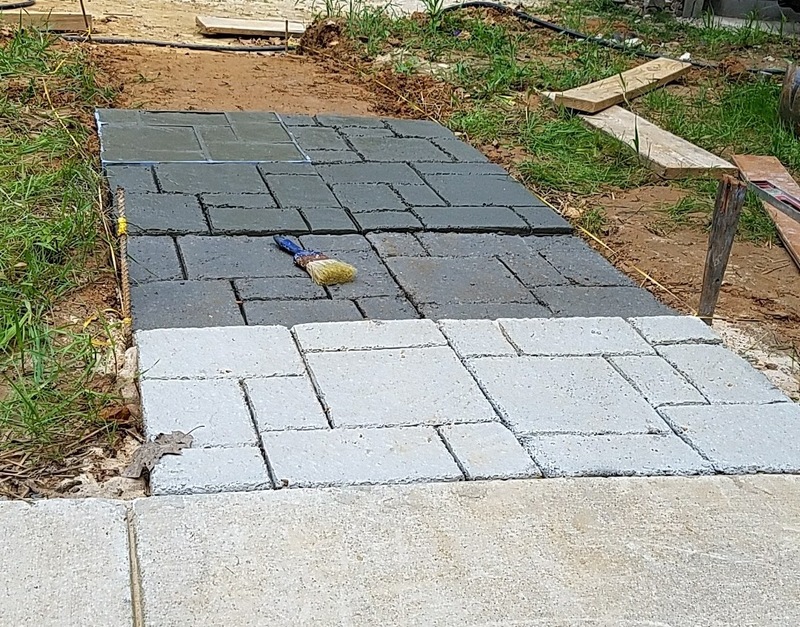 Yesterday was another block laying day, but we had to cut short an hour early because walking and working in the mud was just too impossible. Wet clay seemed like ice when we'd try to walk and every step was precarious. Our yard was more like a pond. The crew was able to get the scaffolding up and lifted piles of blocks to be ready for a drier day. When they started it was raining and by the end of the day the rain was almost over. Trying to get close enough to the house without slipping was a challenge and even then my crocs were covered in mud, making my feet rather filthy. 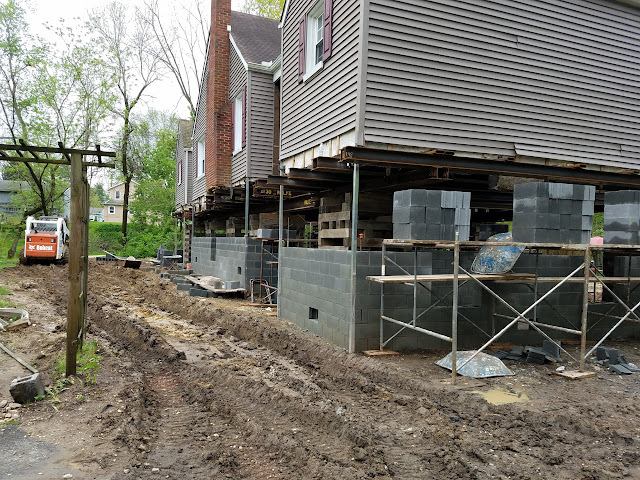 In spite of the rain and mud, we enjoy seeing every bit of progress. 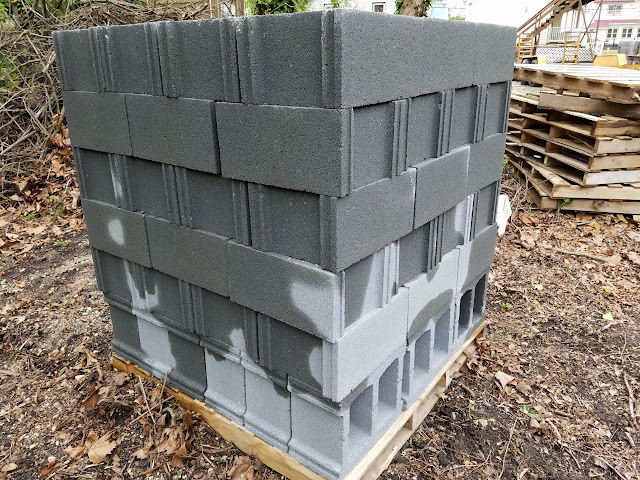 I understand the moist conditions are actually good for the curing of the mortar between the blocks. This is where we normally entertain around our fire pit. We have a bit of cleaning to do before any entertaining happens here! I love the blue of the new clean block. We are reinforcing the blocks with rebar every 36 inches horizontally and vertically to make sure the strength of the block is not compromised by any sideways movement. I never thought that I would enjoy seeing these piles of block stacked around our yard, but they are a sign of progress. 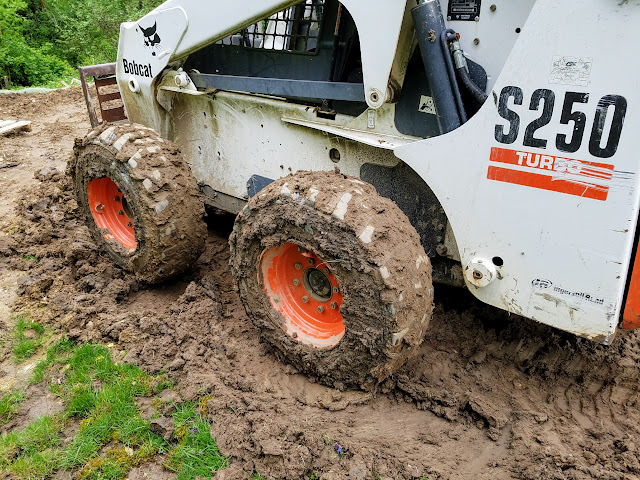 I don't think they can move the bobcat until the mud dries a little. 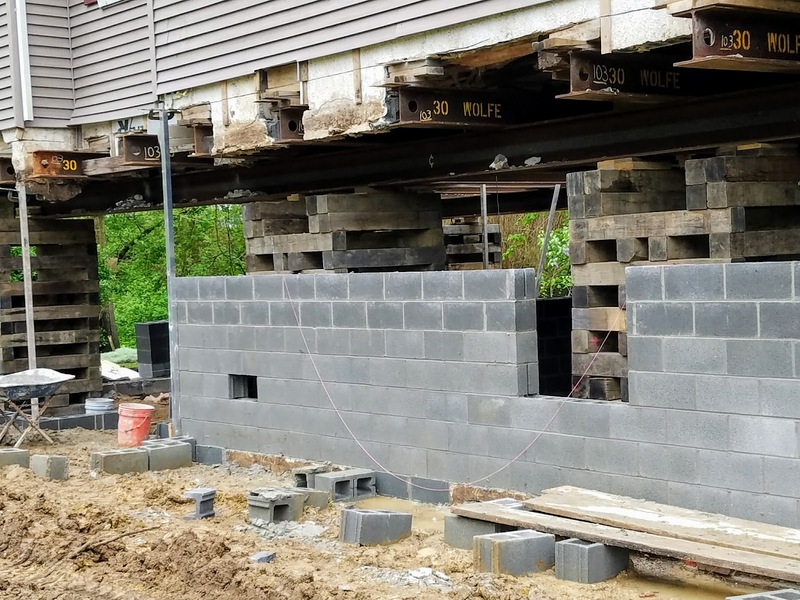 I watched the masons cutting the block and then setting it in place and they are amazingly precise. All the concrete is mixed on site and carried in metal troughs to one of the guys laying block. Thanks to the advice of our town zoning administrator, we went with an expensive but very efficient flood vent. 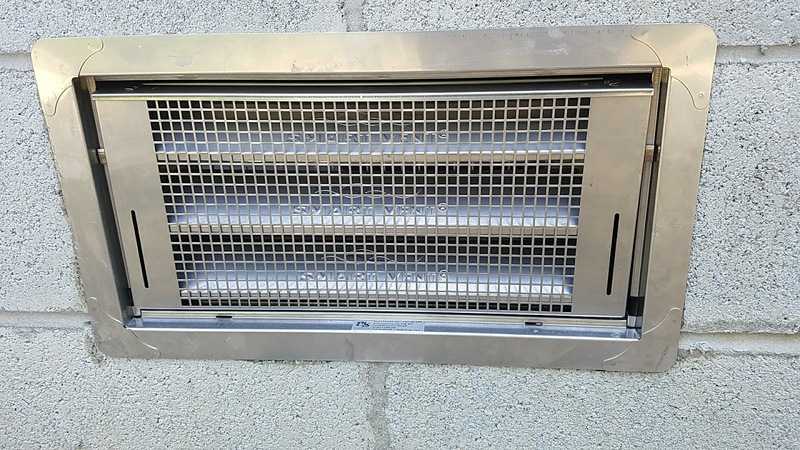 This is called a dual purpose vent because it provides an opening for flood waters to ebb and flow by use of an internal float, which lifts with the water, unlatching the vent. In addition, the vents provide ventilation as a bimetal coil fully opens the vent at 75 degrees and fully closes it at 35 degrees. 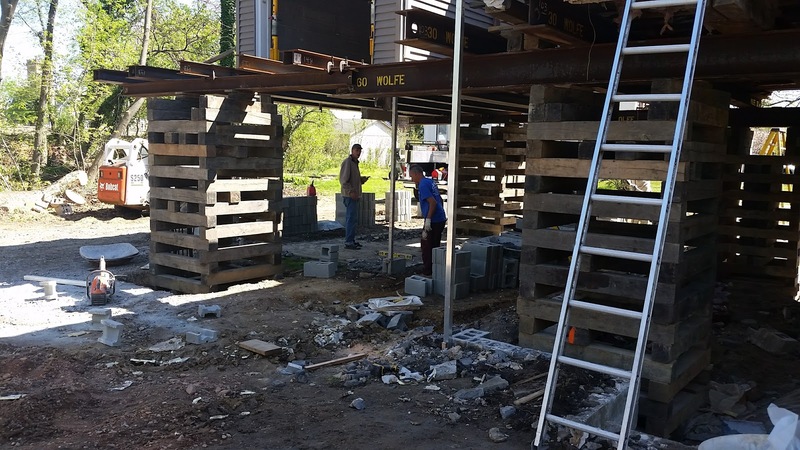 They are marine grade stainless steel and made to withstand harsh environments..
Our breezeway walls are going up.